Milford vs. Nipmuc – Postponed to Tuesday, 10/31 at 3:45. 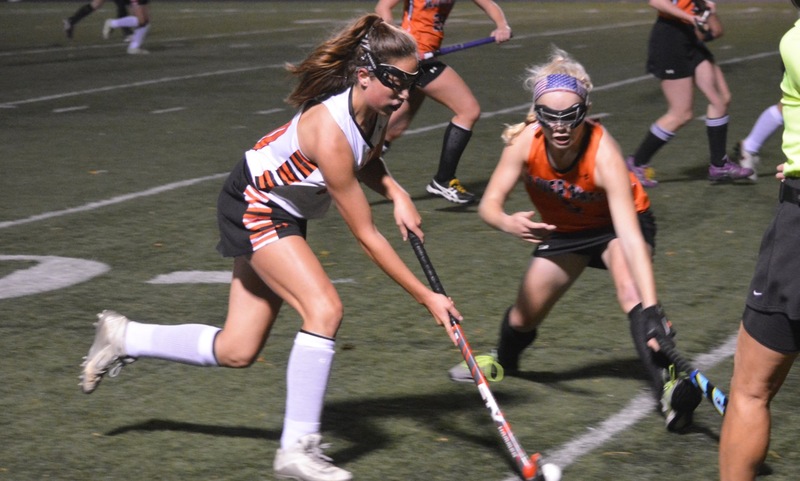 Mansfield, 2 @ Oliver Ames, 4 – Final – Oliver Ames took a one-goal lead into halftime and added three more to conclude its Hockomock schedule with a win over Mansfield. Meaghan Rockey scored once and had two assists for the Tigers, who will travel to West Bridgewater on Friday to conclude the regular season. Maggie Woods, Hannah Stryke, and Sarah Stevens each scored once while Stryke and Cassie Gennis each had an assist. Caitlin Grant made nine saves in net for the Tigers. Attleboro @ Taunton – Postponed to Saturday, 10/28 at 3:30. Stoughton @ Canton – Postponed to Thursday, 10/26 at 5:30. King Philip @ Franklin – Postponed to Friday, 10/27 at 3:45. Milford @ Sharon – Postponed to Friday, 10/27 at 3:45. Stoughton, 3 @ Canton, 2 – Final – Stoughton won games four and five to overcome a 2-1 deficit and grab its 16th win of the season. Senior Val Whalen and sophomore Mykiah Simpson combined for 29 kills while junior Molly Turner got 29 assists and 16 digs for the Black Knights. Senior Taylor Levine played strong in the back row with 17 digs. For Canton, Hannah Jerrier had a great night with 21 kills, hitting .340 and had two blocks. Megan McDonough had 25 digs and four aces and Nicole Brown had another outstanding night with 35 assists and 11 digs for the Bulldogs. King Philip, 3 @ Franklin, 1 – Final – King Philip capped its perfect Hockomock League schedule with a 3-1 (25-20, 25-19, 21-25, 25-18) win over Franklin. Sydney Phillips continued her strong season at the net with 23 kills while Michaela Palumbo added 12 kills and 10 service points. Kat Kmetz had 11 service points, including two aces, and three blocks while Julianne Rando finished with eight digs. For Franklin, Meaghan Maguire (five blocks) and Hailey Sanders (two blocks) each chipped in with eight kills and Maggie Doyle (two blocks) had seven kills. Junior Lauren McGrath had 35 assists for the Panthers. Mansfield, 2 @ Oliver Ames, 3 – Final – Oliver Ames rallied from a 2-1 deficit to win games four and five to earn the win over Mansfield (27-25, 19-25, 21-25, 27-25, 15-11). After an 0-6 start to the season, OA has won 10 of their last 13 games to qualify for the state tournament. Sophomore Allie Kemp led OA with 41 assists and five aces, senior Emma Petrillo had 14 kills and three aces, senior Kayla Raymond finished 11 kills and nine blocks, and junior Sadie Homer had 34 digs. For Mansfield, Julia Harrison had 26 kills and 11 digs, Meg Hill had 25 kills and Emma Ascoli finished with 48 assists and 36 digs.